Winter has well and truly arrived, the highs and lows have dropped by a good 10 degrees and the first light frost settled on the garden last Friday morning. But that didn't have any adverse effects on the garden or the harvests, the tender vegetables had already been cleared from the garden. The harvests are now in full winter mode, there are no more summer stragglers in the harvest basket. The stalwarts of my winter garden tend to be greens, kale does particularly well. This bunch went into a simple soup with turkey broth, tomato puree, Toulouse sausage, and plenty of garlic. The snap and snow peas are still trickling in. One thing that I like about the Golden Sweet Snow peas is that the harvests are more stretched out than any of the green snow peas that I've grown. Another thing I like about them is that they are still tasty if they get to be a bit overgrown and the peas start to bulge a bit in the pods. A couple of the volunteer Spanish Black carrots were starting to push their shoulders up above the soil line, a sure sign that they were large enough to harvest. This photo doesn't do them justice, these two weighed in at 13 ounces without their tops. I paired one of them with some of the snow peas. I cut the carrot into matchstick julienne and cut some of the bulging snow peas into thirds, they were sauteed in a little butter with garlic, dried green coriander seeds, and a splash of fish sauce and served with some chopped fresh cilantro. The radishes are beautiful and sweet even though a few of them are trying to push up flower stalks. I've been using them both fresh and cooked. I quartered some of them and sauteed them with some snow peas and maitake mushrooms, seasoned with oyster sauce and sherry. Others have been paired with celery, apples, and pomegranate arils in salads. The only harvests that I didn't get around to photographing were of celery. I'm so happy that I planted out the celery starts in spite of my doubts about their small size and late start, they have exceeded my expectations, probably because we had such a mild autumn. I've been able to harvest a number of crisp and juicy stalks and the plants continue to grow. Spanish Black carrots - 13.1 oz. Dorato D'Asti celery - 13.8 oz. Lacinato kale - 14.6 oz. Super Sugar Snap peas - 4.3 oz. Golden Sweet snow peas - 6.3 oz. Helios radishes - 5.7 oz. Pink Beauty radishes - 2.7 oz. Pink Punch radishes - 4.2 oz. Selzer Purple radishes - 1.1 oz. The total harvests for the week were - 4 lb., 1.8 oz. And that pushes the harvests for 2014 over the 1200 pound mark to - 1201 lb., 1.1 oz. It's been a really good year! The first frost of the season came on Friday morning, the temperature just barely nudged down to 32ºF. Friday I cleared out the old Green Fingers cucumber plants and the Tromba D'Albenga zucchini vines, those were the very last of the tender vegetables to be removed from the garden. I've been working on clearing out Bed #4, the solanum bed, over the last few weeks. All the tomato plants have been disposed of, and the pepper and eggplant plants are snug in the compost bins and the bed has been sown for the winter. Here's my all natural tomato plant disposal system. I prefer to keep tomato plants out of the compost and I don't want to clog up the landfill with them so I cart the plants away from the garden and give the deer a treat. Bed #4 was devoted entirely to solanaceous crops in 2014, unless you count the cover crop that filled the bed in late winter and early spring. 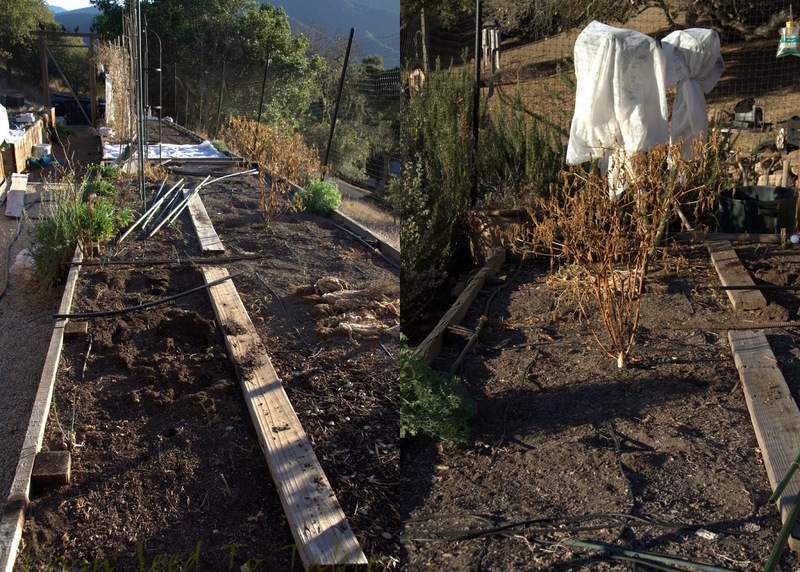 Here's how it looked back in January, I had cleared out the bean, zucchini, and cucumber plants and all that remained were a few Lacinato kale plants (covered to keep the birds from munching) and a frost zapped volunteer Aji Angelo plant. Here's the bed a month later after I had laid new drip lines and sowed most of the bed with a cover crop mix which had to be covered to keep the birds from eating the seedlings. By the end of March the cover crop had matured enough to chop down and dig in. That task was completed by April 2. The worms made short work of all that delectable greenery. There wasn't a trace of greenery left in the soil a few weeks later when I dug in my usual amendments plus about 3 pounds of pulverized egg shells. I had the bed ready for the summer solanums by the 28th. You can read a more detailed post about my solanum bed preparation here. We were in the middle of the third year of a severe drought so I experimented with laying sheets of newspaper over the soil to try to conserve soil moisture. The bed may have been ready for planting but my tomato, pepper, and eggplant seedlings weren't big enough to set out yet. Planting out started in mid May with the tomatoes. By May 28 I had set out all the solanums. The weather was unusually warm this spring and summer (summer here tends to be more like spring) which prompted the plants to leap into growth. Growth slowed at the end of August as the peppers and tomatoes started to mature on the plants. The first cherry tomatoes started ripening at the beginning of August but the larger fruited tomatoes started ripening in earnest in early September. I started harvesting the first ripe sweet peppers in mid September. Disease struck the tomato patch, you can see the brown foliage in the Amish Paste plants rising above the pepper plants on the left. The Amish Paste plants were dead before the end of September, but not before I was able to harvest almost 47 pounds of tomatoes, enough to can about 18 quarts. So I cleared them out for the most part. One of the plants had the neighboring Sweet Gold cherry tomatoes growing through the cage So I left that cage standing. The Black Krim plant was also a goner by this time so I pulled it out too. The pepper harvests continued into early November, the final harvest of good peppers was on the 9th. The tomato harvests lasted a bit longer with the final harvest coming in on the 18th. I'll be looking back at the 2014 harvests in a retrospective post to come some time in the next few weeks. Let's take a look from the other end of the bed where the eggplants were growing. I harvested the first eggplant, a couple of Salanga, on August 2 and the harvests continued into mid September. The plants were hit with a severe infestation of spider mites and and unfortunately my treatment of Neem and Pyganic not only killed the spider mites, but they killed the new blossoms as well. Below, you can also see the brown foliage of the dead Black Krim tomato plant rising above the yellowing foliage of the eggplants. The weather was quite warm this autumn which helped the plants to make a good enough recovery through October and November that they produced another flush of blossoms. Most of the foliage on the plants seen below is new since I had stripped the dying spider mite damaged foliage off the plants earlier. I was able to harvest another 10 pounds of eggplant in December before I cleared out the plants on the 21st, the last of the solanums to be cleared out. Here's the bed now, the Agribon fabric covering the soil down the right side of the bed is protecting the Kodiak mustard cover crop that will be dug in later this winter. The left side of the bed is sown with Extra Precoce Violetto (Extra Early Purple) fava beans. I grow them inside cages covered with bird netting and fabric to keep the birds (always the damned birds) from digging up the seedlings and munching the tender young foliage into oblivion. The cages also keep the mature plants from flopping over when they become heavy with beans. The favas should mature sometime in May, they will be followed by corn and pole beans. The mustard will be followed by bush beans and melons and perhaps squash. My garden is home to a number of Western Fence Lizards, (Scleroporus occidentalis) and apparently this bed was an attractive nesting spot. Unfortunately I figured this out when I was prepping the bed for planting and dug up a cache of eggs. I didn't figure out that these were Western Fence lizard eggs (there are various other lizards and a few types of snakes that I've seen around my garden as well) until I caught her in the act. Can you see her face peering out of the hole that she dug? I found three more spots in this bed where she placed a cache of eggs and marked them so I wouldn't disturb them. In late summer I saw some juvenile lizards racing around the garden - success! Mama lizard making a nest. I guess I must be doing something right if these beneficial critters make my garden their home. and a bunch of baby Salangana eggplants. Saturday I cooked up the first batch of polenta made with my homegrown Floriani Red flint corn. I was torn between making an eggplant stew to accompany it or something more seasonal with my Honeynut Butternut squash and some greens. The squash and greens won, mostly because I had made a lamb and eggplant stew the week before and I wanted something different. For the greens part of the equation I harvested some young Portuguese Tronchuda Beira cabbage. The young leaves have a distinct cabbage flavor and the thick juicy stems are nice and tender. The stew, or perhaps it should be called a sauce or sugo, had ground pork, onion, garlic, celery, fennel seed, oregano, and tomato puree, cubes of butternut squash and squares of cabbage. I added the cabbage at the end so that it just wilted. It was delicious with the polenta. The polenta alone was amazingly good. I ground the corn in my grain mill just before I cooked it so it could not have been more fresh. I used a double boiler to gently cook it for 1 1/2 hours and then added some truffle butter at the end. It wasn't the truffle butter that made it special. I'm not sure if Floriani corn really is as special as it is reputed to be or if the freshness of the ground corn made the difference, but what I particularly enjoyed about the polenta was that it had a distinct corn flavor, much more "corny" than any polenta I've made from purchased ground polenta corn. I don't think I'll be able to use store bought ground polenta again. I made another pass through the carrot patch to thin it a bit more. And I accidentally pulled a couple of baby turnips and pulled a few China Rose radishes to see how they are coming along. The radishes are tasty, not too spicy, almost sweet. The celery has grown enough to start harvesting! I almost didn't plant it out this fall, it was so small and so late to go into the garden, I doubted that it would ever get large enough to harvest. It seems to have loved the recent rainy weather and is growing like crazy, enough to allow two small harvests for the week. One harvest for a salad, it was crisp and juicy, and another harvest for the sauce to accompany the polenta. The only other harvest in the tally that was not photographed this past week was a small bunch of Di Ciccio broccoli shoots. The plants are shrinking away and pretty soon there won't be much left worth harvesting. I also brought in a basketful of green peppers that I saved as I cut down the pepper plants, mostly Lady Bells and Sonora Anaheims. Last week's nasty encounter with green peppers has put me off from adding those to the tally for now. I'm going to try to let the bells ripen on the counter and see if they are edible, if so they will go into the tally. And I'm going to roast a couple of the Sonora peppers to see if they taste ok, if they pass muster they'll go into the tally as well. Di Ciccio broccoli - 10.4 oz. Tronchuda Beira cabbage - 1 lb., 3.8 oz. Amarillo Yellow carrots - 1.7 oz. Deep Purple carrots - 1 oz. Lunar White carrots - 1.4 oz. Muscade carrots - 7.8 oz. Rotilde carrots - 3.2 oz. Dorato D'Asti celery - 12.4 oz. Bonica eggplants - 2 lb., 9.7 oz. Salangana eggplants - 2 lb., 6.5 oz. Sicilian eggplants - 9.8 oz. China Rose radishes - 3.3 oz. Mikado turnips - 1.6 oz. The total harvests for the past week were - 9 lb., 8.6 oz. I'm just 3 lb., 3 oz. shy of 1200 pounds for the year, an all time record for me (actually I'm at an all time personal record already). I have no doubt that I'll be able to rustle up a legitimate amount of harvests in the coming week to get to that nice round number, no green peppers required. It feels like the start to a "normal" winter around here. The rain has finally arrived and is drenching the landscape. The garden is soaking it up and growing strong, as are the weeds. The harvests last week looked mostly typical for the season. The Di Ciccio broccoli plants managed to push out a few more shoots. They are fewer and smaller now but still good. No frost yet means the pea vines are still producing. The fabric covered trellis supporting the vines was the most affected by the high winds. The poles broke but the fabric covering kept the trellis from falling over so I was able to add a couple of poles and prop the trellis upright again with the loss of only a couple of plants. These are the peas I harvested early in the week and I picked a few more yesterday when I repaired the trellis. The Lacinato kale especially loves the cool wet weather. This harvest was sauteed with some garlic and pancetta and paired with Greek Gigante beans. Summer crops are lingering in spite of the weather. This is the harvest of zucchini and cucumbers before the storm. I thinned the dead and dying foliage from the zucchini trellis which kept it from blowing over in the wind. The vines linger but I'm not so sure the the last little zucchinis will mature in the cold wet weather. The cucumber vines actually produced a few more fruits that I harvested yesterday. This was my favorite harvest of the week. Many of the baby eggplants that set and grew in the mild weather that we had in November were ready to harvest. I pan fried about 2/3's of these and used some to make a eggplant and ricotta casserole (sort of like Eggplant Parmesan) and the rest were marinated with some preserved sweet peppers seasoned with crushed fennel seed, garlic, olive oil and served with white anchovies and tuna. I made a stew with the rest of the eggplant, some zucchini, onion, lamb, pomegranate molasses, spices, and smoked tomato puree. The smoked tomato puree was part of my smoked pepper experiments this fall, I put a roasting pan (an old one) full of tomatoes into the BGE with a batch of peppers, then I passed the smoked tomatoes through a food mill and froze the puree. I finally tried the puree for the first time with this stew and I'm declaring success - there will be more smoked tomatoes next year. This next harvest shown below was the most disappointing of the week. Well, not the harvest so much, but the dish that I made with them was absolutely awful, one of the worst things I've ever prepared, thank goodness it wasn't intended for dinner guests. It was so bad that I'm not putting the harvest into the tally, it was inedible. What was this awful dish? A simple lamb stew with green peppers, tomato and wine. Quite a simple preparation which actually had a lovely aroma. But when I tasted the broth of the final dish it was bitter. Then I tasted a couple of the stewed peppers which tasted ok to begin with but left a terrible bitter taste in my mouth. But the worst of it was that the bitterness lingered. I had a sip of wine after tasting the peppers, not immediately but a while later - it tasted awful. I tried a different wine, it was equally awful. And the wine continued to taste bad for at least an hour or so - bleah! So it wasn't the wines, it was the peppers. Yuck! Fortunately, the lamb tasted fine. So I plucked all the lamb pieces out of the stew and tossed the rest. The rescued lamb went into the aforementioned eggplant and zucchini stew a couple of days later where it was delicious. The big surprise and disappointment from this dining disaster is that I've used these varieties of green peppers in other preparations and never had this experience. Generally I do not like green bell peppers, but I find other types of green peppers to be delicious. I'm guessing that the problem was that these peppers were less mature than they would typically be when I harvest them green so they hadn't developed their best flavor yet. It was that or perhaps the green peppers did not combine well with the wine that they were cooked in, that's a combo that I've not tried before. Di Ciccio broccoli - 11.4 oz. Green Fingers cucumbers - 1 lb., 4.7 oz. Bonica eggplants - 1 lb., 10.3 oz. Salangana eggplants - 2 lb., 11.7 oz. Lacinato kale - 13.6 oz. Super Sugar Snap peas - 7.6 oz. Golden Sweet snow peas - 9.2 oz. Early rapini - 10.8 oz. Tromba D'Albenga zucchini - 1 lb., 9.2 oz. The total harvests for the week were - 11 lb., 6 oz. Which brings the total harvests for 2014 up to - 1187 lb., 6.7 oz.